What Is A Short Sale and How Do I Qualify? A short sale is a sale of real estate in which the proceeds from selling the property will fall short of the balance of debts secured by liens against the property and the property owner cannot afford to repay the liens’ full amounts, whereby the lien holders agree to release their lien on the real estate and accept less than the amount owed on the debt. Short sales are one of the most complex of all real estate transactions because there are so many parties involved. In a short sale there is the buyer and seller, the seller’s lender(s) servicing companies, the actual owner of the mortgage or investor, private mortgage insurance company and the government (if a Fannie Mae or Freddie Mac loan). In most cases, the investor is not the lien holder from whom you receive your monthly mortgage statement. All of these parties must be in an agreement before the buyer and seller is able to sell the property. If you are experiencing one or more of these hardships above, then we can get your lender to accept a short sale once we locate a buyer for your property. Some homeowners may choose to work with an agent who is a good friend, family member, or a neighborhood agent who markets themselves to gain additional listings, to conduct their Arizona short sale transaction. Statistically, only a small percentage of Realtors nationwide are successful with short sale negotiations. Like working with the best heart surgeon at a hospital, it is crucial you work with a seasoned and proved professional. Our extensive experience and the relationships we’ve established enable us to provide effective representation and short sale negotiations on your behalf. We don’t just send your file and hope it gets approved. We identify and contact the investor(s) directly to identify their wants and needs before submitting the short sale package. Therefore, in addition to getting your Phoenix short sale approved, we negotiate with the investor to get you full release of all future deficiencies on the unpaid principal balance. We offer a FREE CONFIDENTIAL, NO OBLIGATION consultation to discuss your short sale options in total privacy. Nationwide, banks are agreeing to more short sales, and for the first time, short sale transactions are exceeding foreclosure deals, according to the most recent housing data from Lender Processing Services (LPS) Inc. In January, short sales made up 23.9 percent of home purchases, according to LPS. Meanwhile, foreclosures made up 19.7 percent of sales. Just one year prior, foreclosures made up the bulk at 24.9 percent of transactions while short sales made up 16.3 percent. “It’s a fairly recent phenomenon that short sales have been increasing,” Jonathon Weiner, a vice president with LPS, told Bloomberg News. So why are banks getting more agreeable to short sales? Banks are realizing that short sale transactions usually sell for higher prices than foreclosures. In fact, foreclosed homes tend to sell for 29 percent less, on average, than comparable non-distressed properties. Short sales tend to sell at a 23 percent discount, according to Lending Processing Services data from January. Banks and government agencies in recent weeks have taken steps to speed up the short sale process, setting new timelines for how long mortgage servicers have to respond to short sales offers. Also, some banks, such as Wells Fargo and JPMorgan Chase, are even offering some home owners cash incentives — up to $35,000 — if they agree to do a short sale instead of let the home fall into foreclosure. 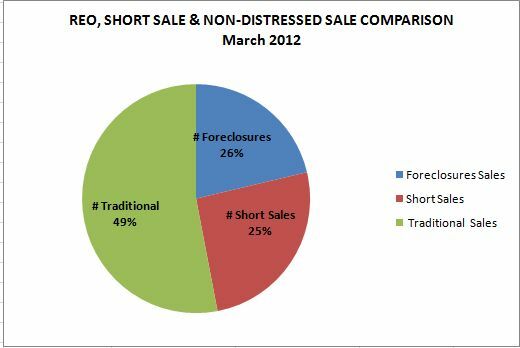 In the Phoenix real estate market, short sale account for 25% of all transaction as compared to 26% for foreclosures. Currently, Phoenix real estate is a hot item for investors and home buyers where the majority of transactions are with traditional home sellers. A year ago, Phoenix short sales accounted for 16% of all transactions as compared to 27% for foreclosures.